It was in August when my friend Camille tweeted a question about movie dates for her article for a men's magazine. Movie dates aren't good for first dates. If you must, have it with someone you already know well, like a friend you just started having romantic feelings for, or a boyfriend. This is because a movie requires that your attention be on the screen, in a movie house, at the mall, and not on your date. Sure, you can talk about it over coffee after, but you basically wasted two hours not getting to know your date. Maybe you could watch a stupid movie so you won't feel bad that you missed a scene while trying to make out. Torrents and DVDs have also made movie dates do-able at home. (Hehe. Do-able.) This means that when you go on a movie date, you're basically agreeing to spend the night at your date's house, in his room. This is fine as long as you both know its implications. 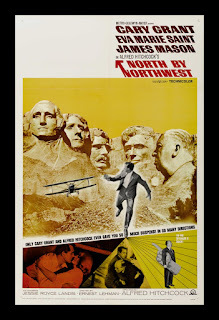 Anyway, I saw North by Northwest on my boyfriend's computer, in his apartment. This 1959 movie was written by Ernest Lehman and directed by Alfred Hitchcock. 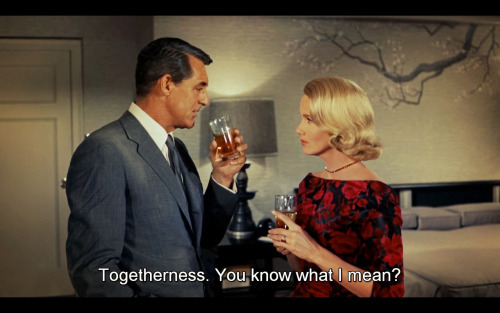 It stars Cary Grant as an advertising executive who gets dragged into a proto-CIA operation by accident. Carey Grant is suh-moothe in this movie even when he's causing a scene at an art auction. His love interest is played by Eva Marie Saint who is really pretty, though she looks old for someone who's 26. (Then again, it's possible my 2013 twenty-seven-year-old self is immature in this Adventure Time t-shirt.) This film was also Martin Landau's first movie role. He plays Leonard, the villain's assistant, whom he says he chose to play with gay undertones. Plot-wise, the movie's episodes can get laborious. "When will his accidental ordeal end? Why is he going back to it?!!!" I like that the set-up is really different from what the movie turns out to be. I also especially like the car scenes because they're classily done despite the knowledge that the cars aren't really moving. Architects, designers, and urban planners would appreciate this movie for how it showcases buildings, public transportation, clothes, and fonts in New York in the 50's. 9/10 Stars. What movies do you recommend people watch on a date? *** Images from http://lecturascinematograficas.blogspot.com and Tumblr.